HVDC cables are used to transmit high voltage direct current across long distances. For the purpose of this study, high voltage has been defined as 35 kV to 475kV. The study also covers extra high voltage (476 kV to 800 kV) and ultra-high voltage (above 800 kV). HVDC transmission lines are highly cost-effective over long distances. They can carry large amounts of electricity from one location to another with limited loss of power during the transmission. Increase in adoption of renewable energy has resulted in a wide discrepancy in regions where such power is generated and those where it is consumed. For instance, in China, the potential of power generation is high in western parts. However, consumption potential is high in eastern parts. In such cases, the solution lies in transporting electricity from the source of generation to consumption. HVDC cables is the most popular technology to do so. The ability to transport energy over long distances is expected to be a major factor driving the market. HVDC transmission lines are used to transport power over long distances. It is economical to build these lines overhead rather than underground or under the sea. However, overhead lines require a high number of towers to be built for the cables to be hanged. Similarly, underground lines require a large number of joints and termination bays. Not only do these towers and bays require space, but they also require a right of the way. The land through which the overhead or underground lines pass cannot be used for another purpose. For instance, buildings cannot be constructed on such lands. It is also not possible to carry out agriculture practices or plant trees with deep roots in such lands. HVDC lines require large amount of such lands. This can be difficult to acquire. Initially, most of the HVDC transmission grids were installed to supply power by interconnecting power grids between countries or over distances within the same country. This was partly because HVDC grids were cost effective over HVAC grids only beyond a certain distance such as 500 km-800 km on land and 70 km-80 km under the sea. However, technological progress has ensured that HVDC lines can be cost-effective even at short distances, especially in case of subsea applications where the distance has reduced to ~ 40 km. HVDC lines can carry high voltages of power such as 200 kV, 320 kV, 400 kV, and 500 kV. Therefore, these transmission lines are useful to transfer power from offshore wind farms or solar farms to the main grid. Similarly, they can also power various offshore infrastructures, such as FPSO and oil platforms, in the oil & gas industry. This type of application of HVDC cables is likely to increase during the forecast period. The number of renewable energy power plants has increased across the globe. Many of them are now constructed offshore. This trend is expected to continue during the forecast period. It is necessary to connect not only the renewable energy power plants constructed offshore, but other offshore infrastructures to the main grid. HVDC transmission line is anticipated to be the most cost-effective way of connecting these to the main grid. Mass impregnated cables and oil-filled cables were commonly used in HVDC transmission lines when the technology was first used in the 1950s. These types of cables continued to dominate the market for several decades, before the advent of extruded cables in 1990s. Extruded cables have now become the dominant form of HVDC cables. The extruded cables segment, especially XLPE cables sub-segment, has gained momentum since the 1990s. The extruded cables segment accounted for larger share of the market than the mass impregnated cables segment in 2017. Market share of the extruded cables segment is likely to increase during the forecast period due to technical advantages such as light weight, long length, and good connectivity. Additionally, these cables are environment-friendly. This, in turn, is projected to boost the segment in the near future. Countries such as the U.S., China, and Canada utilize their vast areas to build overhead transmission lines. Overhead HVDC transmission lines cost lesser than underground and submarine lines. Hence, the overhead line segment accounted for dominant share of the market in 2017. Market share of the segment is projected to increase during the forecast period due to the low cost and ease of building of overheard lines. Europe was the first region to adopt HVDC transmission lines. It also has the highest number of installed transmission lines in the world. Scandinavia has the highest number of HVDC cables in the region. Market share of Europe started decreasing in the 21st century when China adopted the technology. Since 2000, China has built a large number of HVDC transmission lines. The country continues to build them at a rapid rate. China has been a primary driver of the HVDC cables market in Asia Pacific. Asia Pacific accounted for a dominant share of the global market in 2017. Market share of the region is anticipated to increase during the forecast period due to the rise in adoption of HVDC technology in India, Japan, and ASEAN. 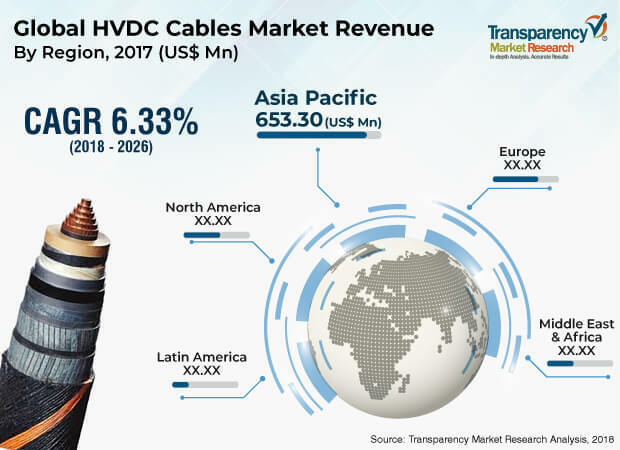 The global HVDC cables market is highly consolidated; it is dominated by a few players. Companies require high level of expertise to enter the market. Additionally, every HVDC transmission line needs to be highly customized to suit project requirements and specifications. Hence, it is also a highly lucrative market. This has resulted in several mergers and acquisitions in recent years, as companies have tried to consolidate their position in the market. For instance, NKT A/S acquired ABB’s HV cable business in 2017, while Prysmian Group acquired General Cable Corporation in June 2018. Furthermore, Nexans Group acquired Nippon High Voltage Cable Corporation in 2017. These acquisitions have helped companies obtain relevant technologies for further success in the market.